Passengers who board TCAT Bus No. 1118 may notice two rows of seats that look a little out of place. 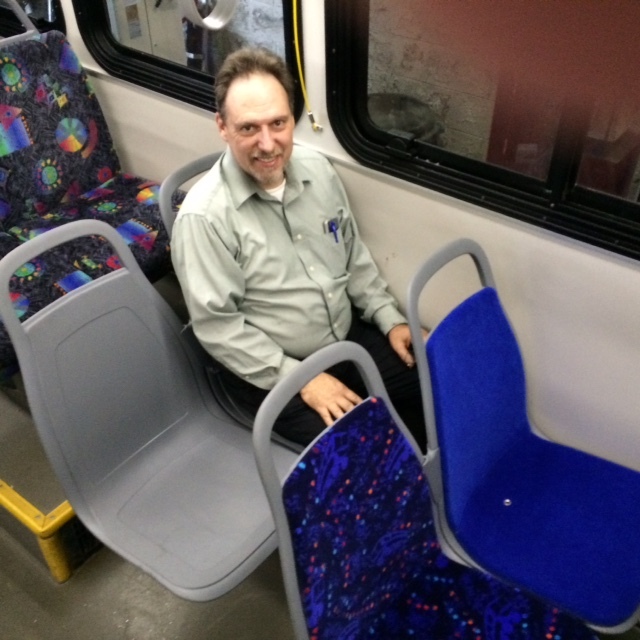 TCAT Interim Maintenance Manager Jim Caco, shown above, and his team this week installed state-of-the-art seats, manufactured by Michigan-based American Seating Co., for riders to test out and give their feedback. The seats will be on the bus, a 2011 Gillig, for passenger testing about six weeks, Caco said. All TCAT buses, including No. 1118, are rotated into service among many of TCAT’s 33 routes so he hopes many riders, using urban, campus and rural routes, will have the opportunity to “take a seat” on the test seats and voice their opinions. Passengers can provide feedback by emailing TCAT at tcat@tcatmail.com or call TCAT Communications and Marketing Manager Patty Poist at (607) 277-9388, ext. 560. Caco said the demo seats are durable, sleeker and lighter, and will be easier to clean than the heavier-framed cushioned seats now installed on TCAT’s fleet of more than 50 buses. Both set of the demo seats are made fiberglass and ABS (Acrylonitrile butadiene styrene) plastic, which is very durable and impact resistant. One set of the demo seats is without fabric and the other set is covered with a light antimicrobial, liquid-resistant fabric that is extremely resilient to wear and tear, Caco said. If a passenger gets sick or a seat is otherwise soiled, buses with the heavier-framed cushioned seating must be taken out of service and professionally cleaned and dried, which takes several hours, Caco said. That process puts a strain on service, especially during rush hour when the majority of the fleet is needed to fulfill service, he said. Caco said the demo seats are ergonomically designed and provide better back support and more leg room than the current seating. In addition, they take up less space so there is more aisle space. “They provide much more comfort than our current seating, more personal space and more hip-to-knee room,” Caco said. If TCAT decides to go with the new seating, they would be installed “by attrition” in any new buses TCAT purchases in the future. At present, TCAT is about to order 10 new buses, which take up to 18 months to manufacture. Caco added that if TCAT opts for the seating, the agency could also consider adding USB ports on the backs of the seats so passengers will be able to charge their cell phones, laptops and other mobile devices.